July 6 this year is World Zoonoses Day! In honor of this day we would like to help spread the awareness of zoonotic diseases. You are probably asking yourself, “what is a zoonotic disease?” Simply, it is a disease that can be spread from animals or your pets to your family. Leptosprosis – A bacterial infection that your pet can get by drinking tainted water and transferred to humans through soil and water tainted by your infected pet’s urine. Rabies – A virus that can be passed on to humans through infected animal bites. Lyme Disease – A bacteria spread by ticks. 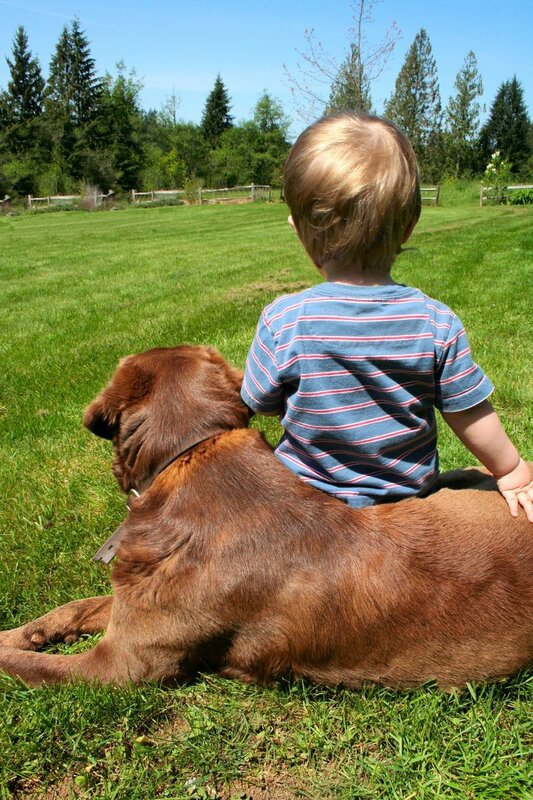 If your pet brings in an infected tick and it moves on to your family, then they could catch the disease. Intestinal Parasites – This category includes roundworms, tapeworms, hookworms, Giardia, and Toxoplasma. All of these little creatures can be passed on from your pet to you or your family is proper precautions aren’t taken. Toxoplasma is especially dangerous for pregnant women.These parasites can be passed to your family by coming into contact with any contaminated material, such as your pet’s feces. Ringworm- This one is actually a fungal infection. If your pet has caught the fungi then it can very easily spread to you or your family if you touch the infected area. Scabies – Scabies is caused by mites that burrow in the skin and lay their eggs. However there are human mites and animal mites. When your pet has the animal mites they may jump onto a human and try to burrow. They won’t live long enough on a human to lay eggs, but they will create an irritating rash on you and your family. The rash will also stay consistent if the problem isn’t dressed for your pet. 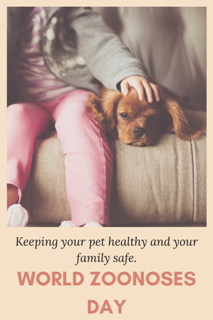 To protect your family and keep your pet healthy, the first step is prevention. It is important for your pet to stay up to date with all of their shots, tick and flea medication, and other preventatives. Prevention will cost you less in the long run than if you were to have to treat for any of these ailments. For example, heart worm preventative costs $5 to $15, but treatment reaches the thousands. Not only this, but bringing in stool samples to your vet on a regular basis can also help keep your family safe and healthy. When you bring in a stool sample every visit it is checked for intestinal parasites. Keeping this consistent means that if your pet has a parasite it can be detected earlier and the risk of it being spread to your family members is reduced. 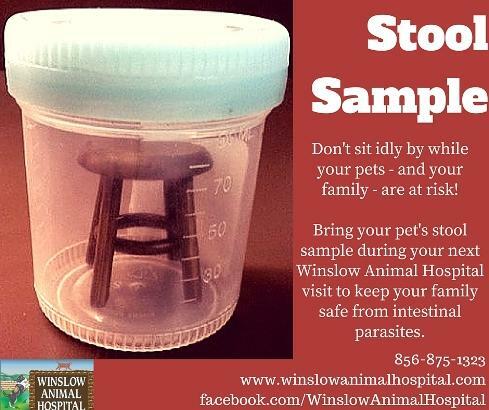 You don’t even need an appointment at Winslow Animal Hospital to have a stool sample checked, that is how much we believe in preventing these diseases to keep your animals and your family healthy. At Winslow Animal Hospital, we are here to help you prevent against these disease. We strongly encourage you to keep with your preventatives and bring in those stool samples. We wish you, your family, and your furry friends wonderful health!